AxioMed, LLC announced today that its event at the American Academy of Orthopedic Surgeons (AAOS) Conference in Orlando, FL on Thursday March 3, 2016, fostered a lively discussion about the future of total motion restoration in spine. The event took place at the JW Marriott, and was attended by a variety of industry players, including established practicing surgeons, academics, fellows, and biologics and medical technology producers. Members of the press were also present. Dr. Jens Chapman, an Orthopedic Surgeon who practices at the Swedish Neuroscience Institute in Seattle, WA, and has been a proponent for sound evidence-based spine motion restoration procedures, participated in the discussion, raising important high-level and technical points about total facet replacement. 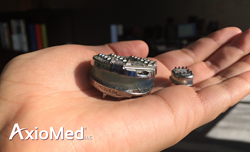 He said, “In spine, we don’t have a good solution for total segment restoration yet. For facets we need to find a treatment that’s less bulky, yet effective and use it in patients where simple treatment, such as decompression surgery alone is not applicable." The evening also featured a talk from Invibio about the benefits of HA PEEK and SpineFrontier's pioneering role in bringing it to market. Jake Lubinski, President of AxioMed, LLC spoke about facet replacement, a solution that Dr. Kingsley R. Chin patented in 2002, and how the AxioMed Freedom total disc replacement, together with facet replacement technology, represents a huge step forward for the industry. Founded in 2001, AxioMed began its journey of exhaustively proving the Freedom® Disc through research, development and testing. In 2014, KICVentures recognized the disc’s enormous potential and acquired the company into their healthcare portfolio. AxioMed owns an exclusive viscoelastic material license on its proprietary Freedom Disc technology. SpineFrontier Inc. is a growing medical technology company that designs, develops and markets both implants and instruments for spine surgery based on the Less Exposure Surgery (LES®) Philosophy. These technologies are designed to allow for outpatient surgery due to minimal disruption of normal tissues. SpineFrontier is headquartered in Malden, MA. It is a KICVentures portfolio company and the leader in LES technologies and instruments. KICVentures manages several portfolio companies (including AxioMed, LLC and SpineFrontier®, Inc.), investing in disruptive technology in the health-tech sector. KICVentures acquires, creates, and nurtures companies and their technologies to their fullest potential.